Secure and seamless internet access - across locations and devices. eduroam is provided to the UK via the Janet Network. eduroam provides users with authenticated network logon and access to the internet through a single wifi profile and set of credentials, wherever the service has been made available by participating organisations. Connection can be seamless and automatic. Wired connections can also be supported. Our live online clinics run regularly on the first Tuesday of every month. By eduroam-enabling the network, organisations can provide guest network access services to visitors without the need for guest account management, saving time and cost for both the organisation and the visitor. Participating organisations, using their existing infrastructures, connect to national NREN-operated RADIUS systems and overlay eduroam network services, which adhere to comprehensive technical standards. AARNet (the Australian research and education network) have created a 'what is eduroam?' animation which helps explain the benefits to users of the service. When you use eduroam when roaming away from your home organisation, we will collect an identifier of your device ('calling-station-identifier') and the time stamp of any connection attempt. Whilst not personally identifiable information, we will also collect an identifier of the organisation providing the eduroam wifi service you are connecting to ('operator-name'). We will also collect the 'outer' identity username in the authentication request. The outer identity username is used to route the request to your home organisation and if you have not set this to be anonymous it will contain your user identity. You should configure your device to use an anonymous identity and in this case the information we collect only identifies your home organisation. The items of personal data we collect are not sufficient in themselves to enable eduroam(UK) to identify you as an individual, but may be passed to legitimate authorities. We collect this information in order to enable a secure and trusted eduroam service to be provided, to produce anonymised usage statistics, to facilitate troubleshooting and to provide compliance with the Janet security policy and acceptable use policy and to maintain the private network status of Janet. The collection of this information is also mandated by the European eduroam confederation of which eduroam(UK) is a member and which facilitates international roaming. When you use eduroam away from your home institution, the local eduroam service provider will collect an identifier of your device ('calling-station-identifier') and the IP address. It will also collect the 'outer identity' you have set on your device (which may be anonymous, but you may have set this to contain your user identity) and it will collect the time stamp of any connection attempt. This information is collected in order to enable a secure and trusted eduroam service to be provided, to produce anonymised usage statistics, to facilitate troubleshooting and to provide compliance with the Janet security policy and acceptable use policy and to maintain the private network status of Janet. This information on its own cannot be used by the visited site to identify you as an individual, but may be passed to legitimate authorities. When you use eduroam away from your home institution, your home organisation will also collect authentication event data. The data we collect will be held for a maximum of 12 months. Access to it will be restricted will only be passed on to other eduroam member organisations, GÉANT the European eduroam operator or to UK national authorities, in order to co-operate in investigations of breach of security or AUPs or the law; except that the device identifier may be passed on to GÉANT to produce anonymised usage statistics. In general we will only use your information in line with the Jisc GDPR policy. Any Janet connected organisation is eligible to use eduroam at no additional charge. To check if you are registered email help@jisc.ac.uk. To apply, visit our community page on how organisations can join the service where you will also find the eduroam application form. Applications can only be accepted from directors or network management contacts registered with Janet. Individual users do not need to separately join the service. Instead, if you are a member of a participating organisation and you have a network logon account, you can use eduroam. Find out more about joining eduroam on the eduroam community site. If your organisation is considering providing the eduroam service, you are recommended to familiarise yourself with the technical requirements on the eduroam documentation area of our community site. You will also need to read and accept the eduroam usage policy. Organisations wishing to proceed and join the service should note the terms of eligibility and rules of membership. Once your organisation has a good understanding of the implementation roadmap and the technical specification, please complete the eduroam application form which can be found on our community site. For more information e-mail the service desk. In applying, applicants place themselves under no time commitment to implement an operational service, although it is suggested that this should be achieved within six months of application. Technical support is provided by eduroam technical specialists and is available, at no extra charge, to any organisation participating in eduroam or considering joining. If you have any queries contact help@jisc.ac.uk. eduroam users can now more easily locate eduroam-enabled sites thanks to an app for iPhone, iPad and Android devices. The app is free, and the iOS version is available on the App Store, while the Android version is available from a number of sources, including the Google Play store. Since the app taps into the central eduroam.org database, details of services throughout a number of participating countries are available. There are some countries that do not provide data to the eduroam.org database, so coverage is not total. Equally, not all organisations provide similarly comprehensive data sets of where they provide service. In order to address this issue, a feature has been built in which enables users to contribute to the accuracy of service coverage information - the app allows users to tag locations where they find eduroam. Once the minimum threshold of tags have been received for a hotspot, a new location marker is created. A federated service to provide authenticated wireless/wired network connectivity for users roaming to participating member sites. The configuration used at the user’s home organisation (authentication method, username and password/certificate) enables access to be granted wherever the eduroam SSID is seen. This allows network access for visitors to be provided without the need to set up and administer visitor network accounts whilst also supporting users at their home sites. The national authentication forwarding service (National RADIUS Proxy Service) is available 24 hours a day, seven days a week all year. The target availability for the national RADIUS proxy is 99.5% during the hours of service defined above, measured monthly over a 12 month period, excluding service-affecting maintenance. Faults with the service may be reported via the service desk on 0300 300 2212 or via email: help@jisc.ac.uk. The National RADIUS proxy servers are hosted on separate platforms located at a number of Janet Network colocation sites. Organisations must ensure they understand and adhere to the security policy. Organisations may request participation in the service by completing the eduroam application form which can be found on our community site. Access to the National RADIUS Proxy Service will be enabled within 15 business days of receipt of all necessary information and you completing the configuring your RADIUS proxy server(s). An initial response to any inquiry will be given within eight business hours, as defined in SLD definitions. If you are experiencing an issue with the service, and wish to escalate the issue within Janet please contact us via the service desk on 0300 300 2212 or via email - help@jisc.ac.uk. 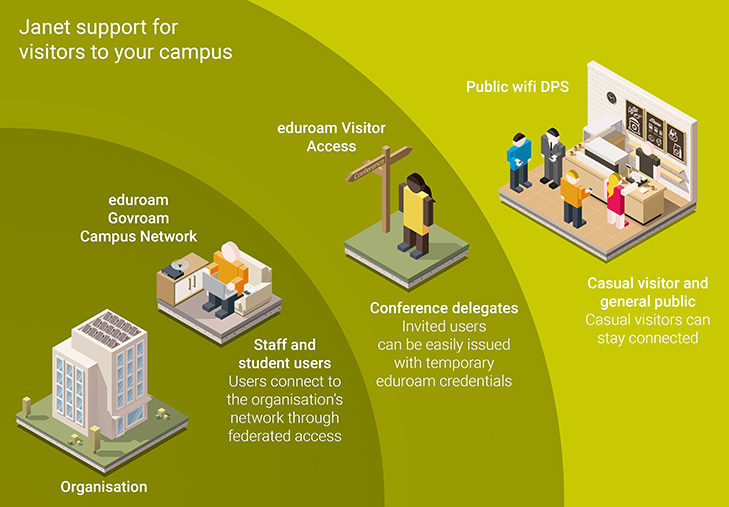 eduroam Visitor Access lies ‘in between’ federated roaming and general public access, helping you provide access to people without their own eduroam accounts but who are associated in some way with your organisation’s education goals.